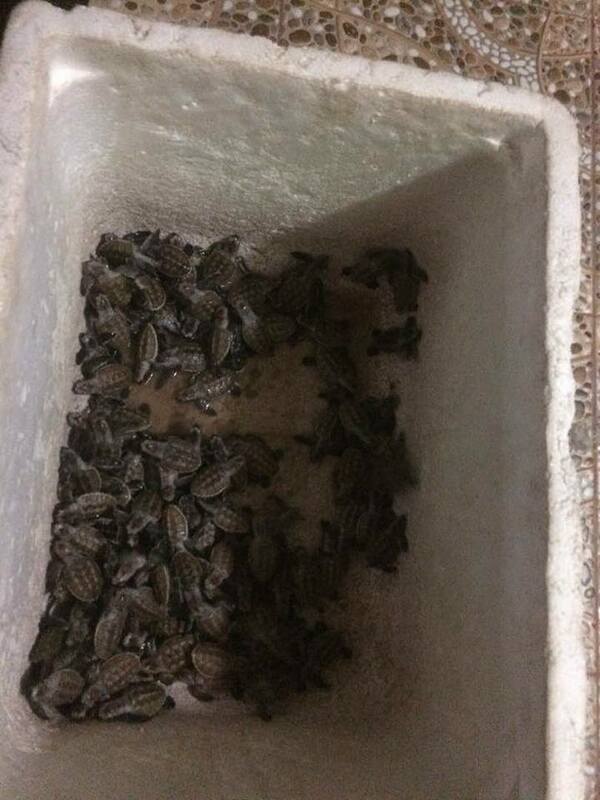 Last night we rescued 99 baby turtles! 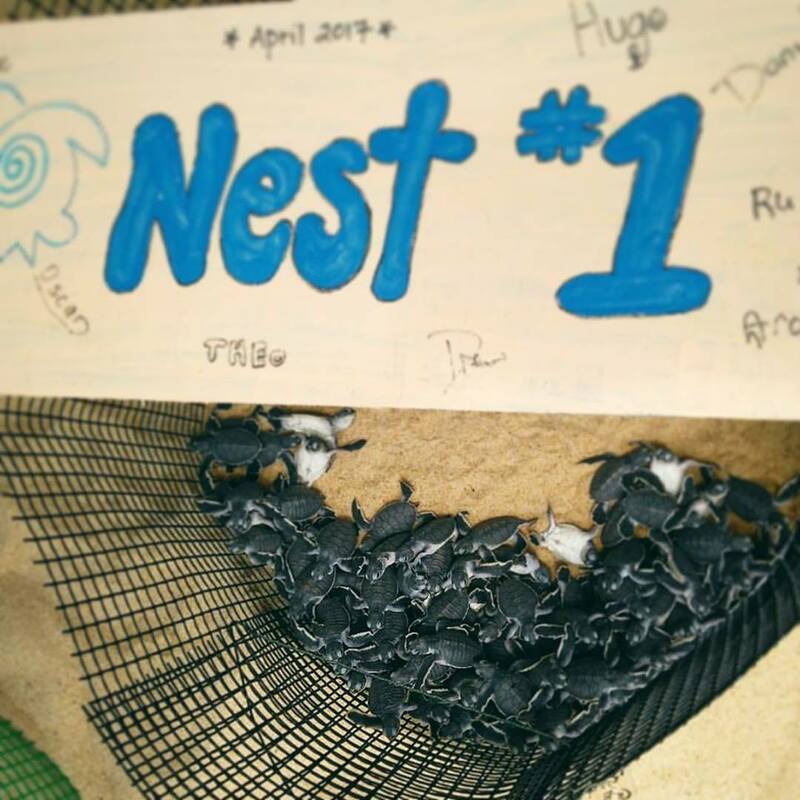 The nest was laid naturally and had gone unnoticed for the last 2 months during its incubation period. When the babies hatched they were disoriented by the nearby artificial lights. 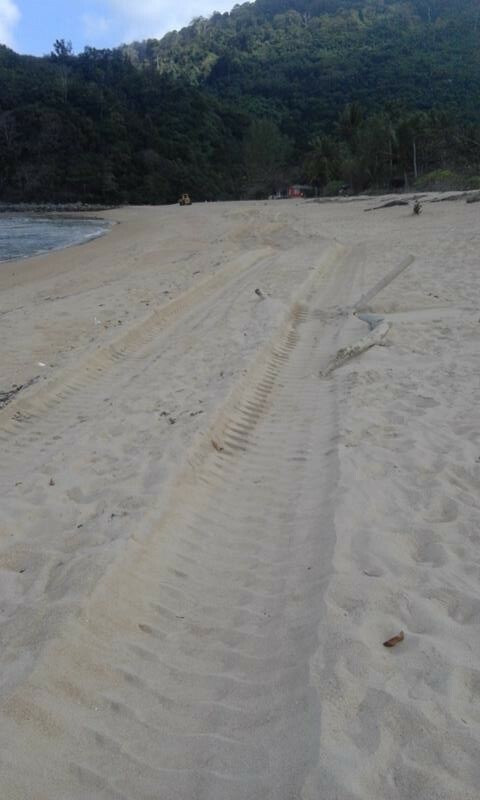 This is an example of why reducing visible light on the beach helps baby turtles to go safely to the sea. 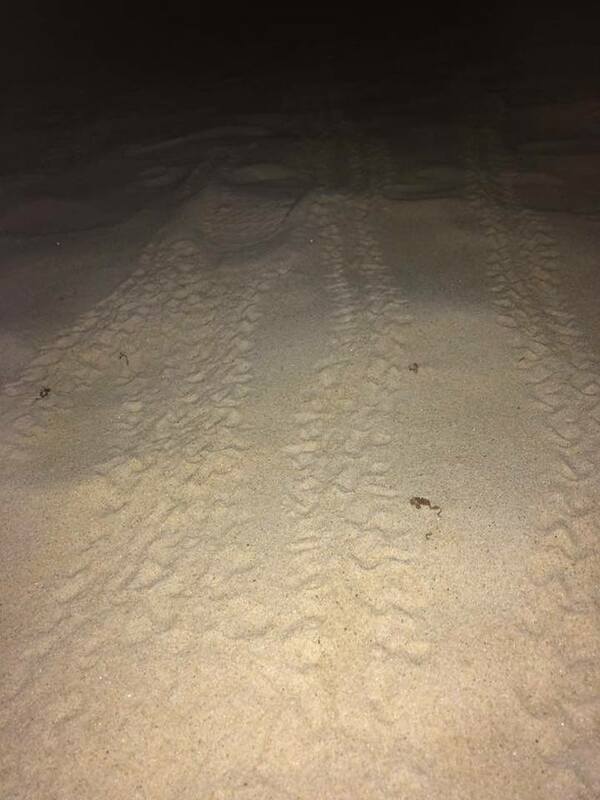 Here you can see the baby turtle tracks in the beach sand at night. 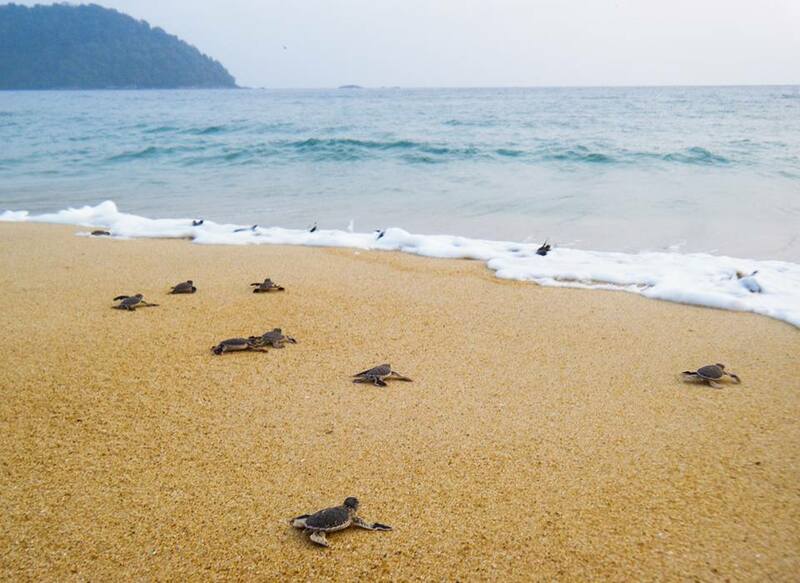 The babies usually go towards the natural light over the ocean… but if they are near artificial light like these ones, then they will head towards that. In this case the light source was beach resort and chalet lighting. The babies will usually get as close to the light as possible, in this case right under it! They are not too smart yet and are just following their instincts to go towards the light which is usually out on the ocean’s horizon. 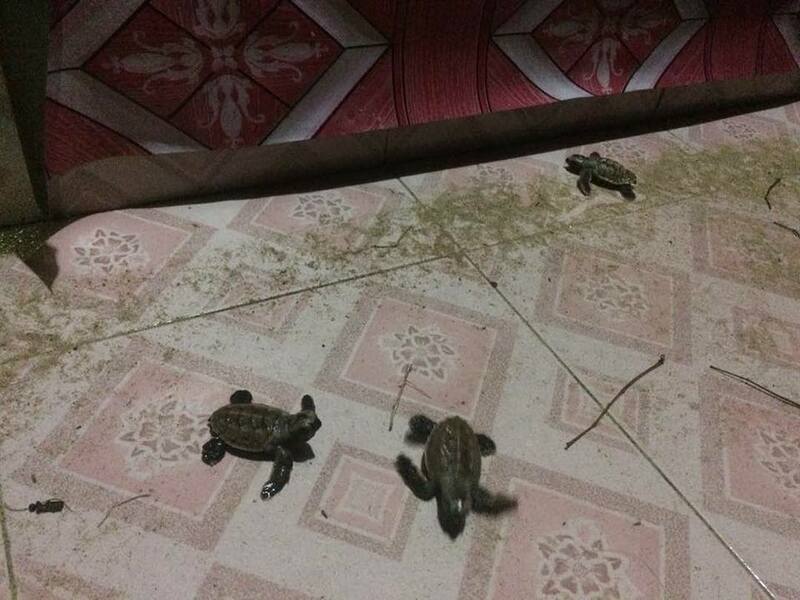 Thankfully the local resort got in touch with us when they discovered the lost babies, and we were able to find 99 baby Hawksbill Turtles confused on the beach and on the resort property! 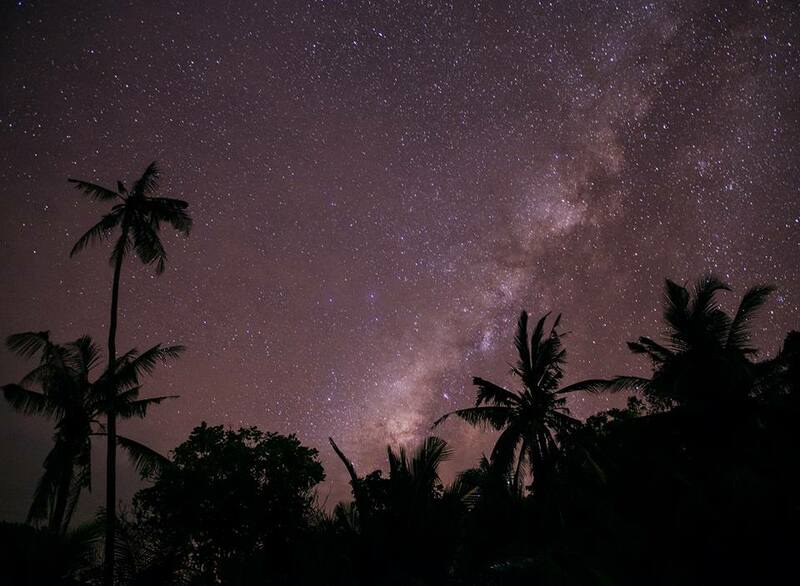 Thanks for letting us know about them Juara Mutiara Resort! 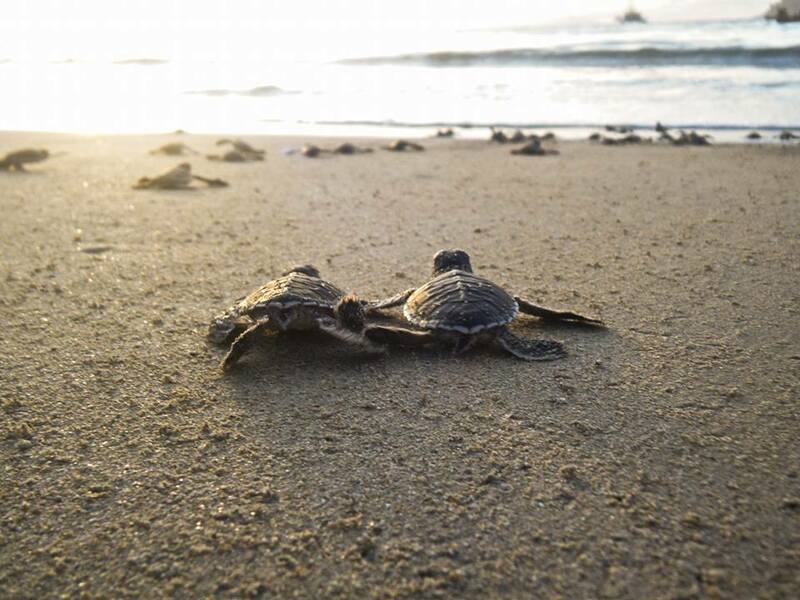 Here are a few photos of these green sea turtle babies’ mad dash to the sea as they begin their life’s journey in the ocean. 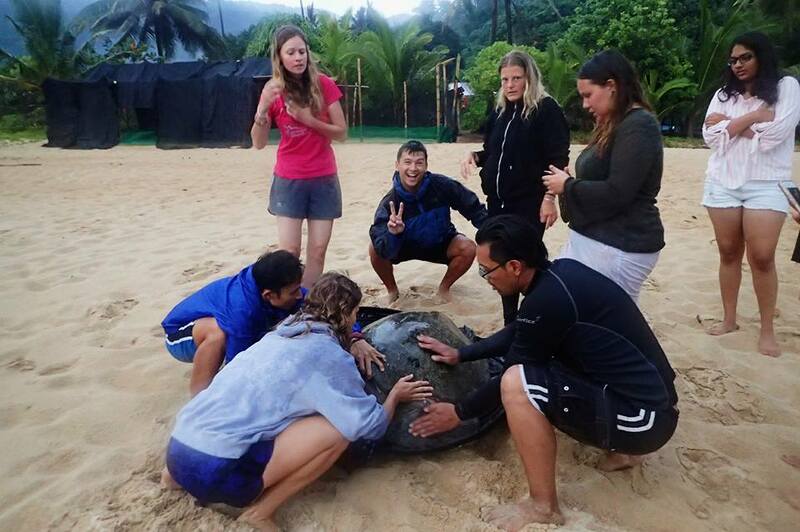 They are leaving from Juara, in front of the turtle project on Tioman Island earlier this week.. Good Luck!! 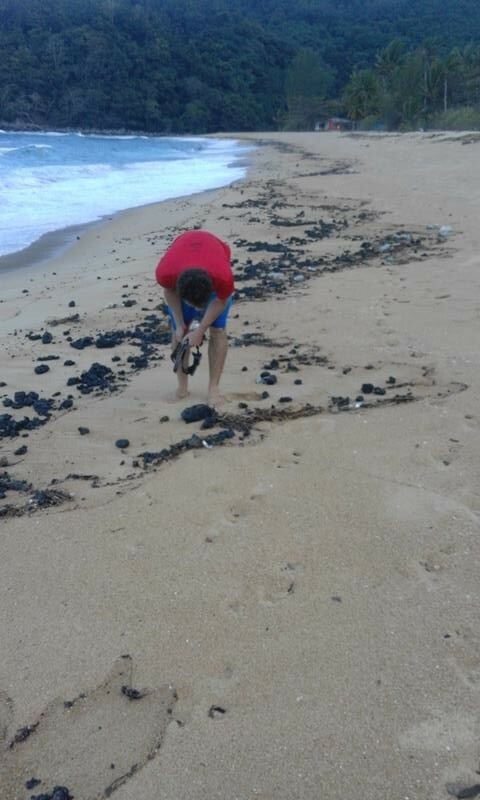 We found her coming to Mentawak beach for several times without laying any eggs. We think She might has internal complications as her carapace has minor boat propeller damage. We’re bringing her to see a veterinarian on the mainland today. What a way to start our morning with! 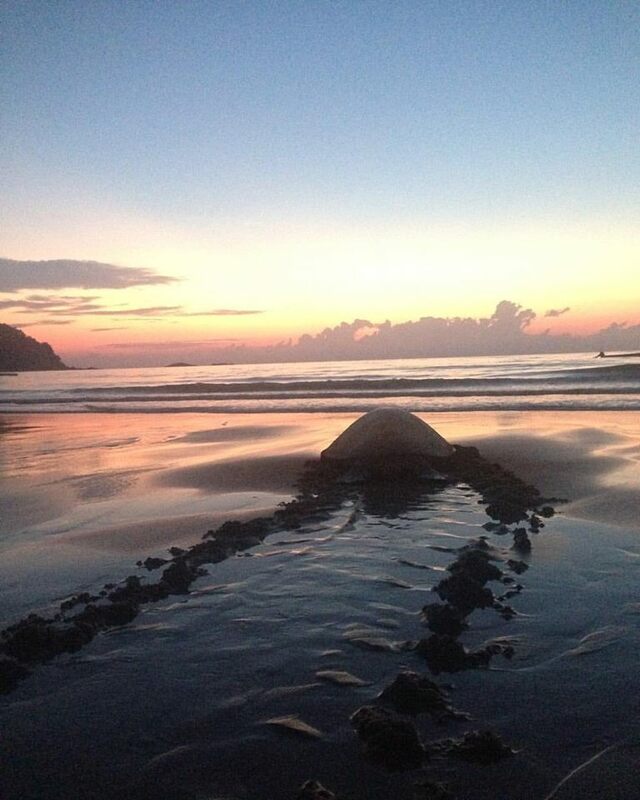 Nesting turtles spend hours on the beach to lay their eggs. But this particular mother only dug a couple body pits before she returned to the sea. Hope she will come back to lay the nest! And we are taking this opportunity to thanks all the supports that coming through after the Green Turtle Autopsy video. 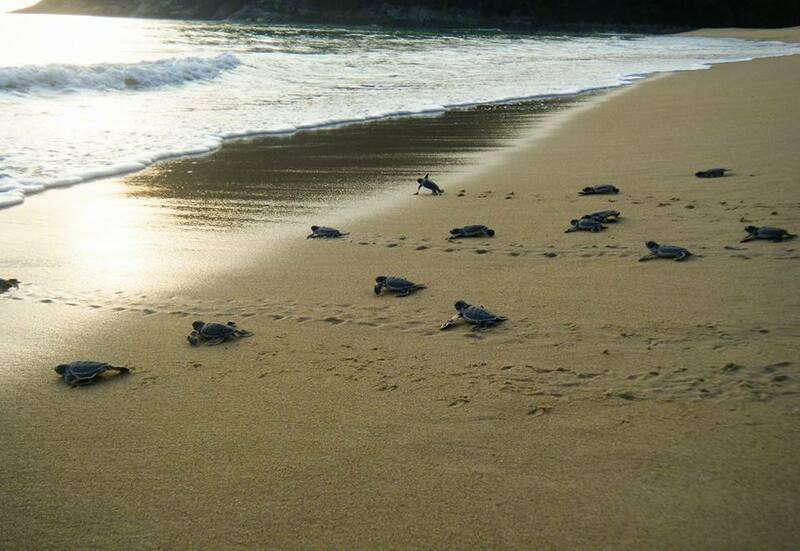 You, personally can help these turtles in many ways from going extinct! This unfortunate death offered this unique opportunity to discover and exposes the cause of death for this poor green sea turtle, and to show some of the effects of plastic pollution in the sea. Through a desire to learn more about our sea turtles habitat and an ever growing understanding of climate change impact, we here at JTP are driving a new project to greater monitor and assess the coral reef here in Juara Bay. Having been visited by Stefan Peters (Senior Lecturer in GIS – Global Information Services, at University of Technology, Malaysia), we were fortunate enough to have him share his expertise on digital mapping. Stefan volunteered with us here at JTP in April 2015 and could not wait to come back to guide us through this exciting new project. Stefan returned earlier this month and spent three intensive days teaching staff members how to use digital mapping software. He downloaded and brought with him an abundance of satellite images and official government mapping data that we would not ordinarily have access to. During his short stay we managed to come up with two separate methods of accurately measuring coral reef areas in Juara Bay. The next step is the fun part…we will sea kayak out to the reef to snorkel and make observations while taking underwater pictures. We will collect GPS data from different key locations and collate this into the mapping software. 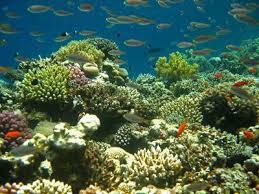 Over the coming months we plan to create an interactive database where any new information brought ashore by someone out snorkeling in the bay can be easily added to the map, this information will grow and eventually paint a realistic picture about the overall health and vitality of the coral reef areas. Eventually the goal will be to identify all manner of coral and associated wildlife in these areas down to species level, and monitor them over a period of many years, charting their growth and reproductive cycles. By having it on a digital mapping format we should also be able to display the information on charts and maps in our education center as hard-copies so the general public can have access to this type of information. Has this inspired you or peaked your interest? We are looking for volunteers who have experience in underwater photography (perhaps with a high quality camera), skills with GIS, knowledge on coal species and methods of identification. If this sounds like you, please hit the link to our volunteering web page and drop us an e-mail. 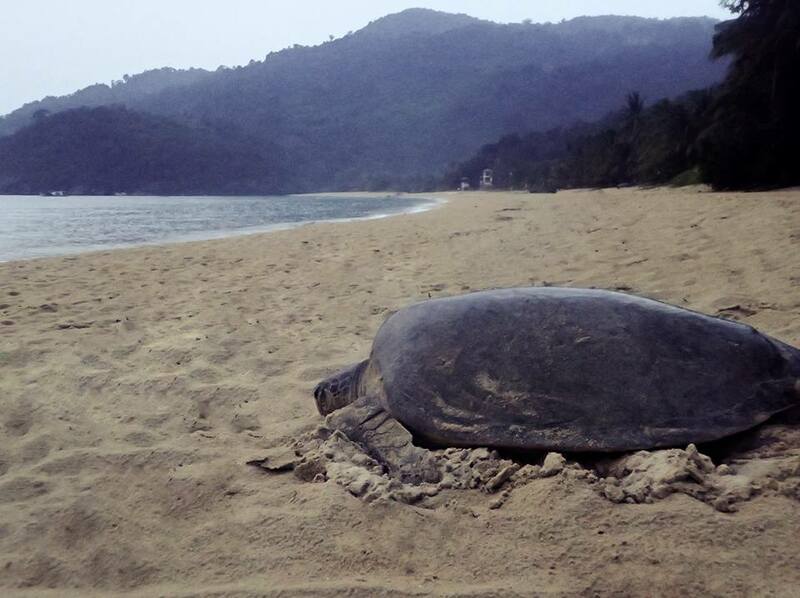 In the afternoon on the 5th of April, JTP was informed by local’s in Kg Paya that an injured adult green sea turtle had been spotted in the same area for 3 consecutive days. JTP immediately organised rescue equipment and a boat was kindly offered by Riverview / Little Planet. Two members of staff and JTP founder John Amos set on their way to assess the situation. We arrived in Paya to pick up the local guys and they took us up the river to find the turtle. It didn’t take long to spot her, she was deep along the river , an unsuitable habitat for a sea turtle. 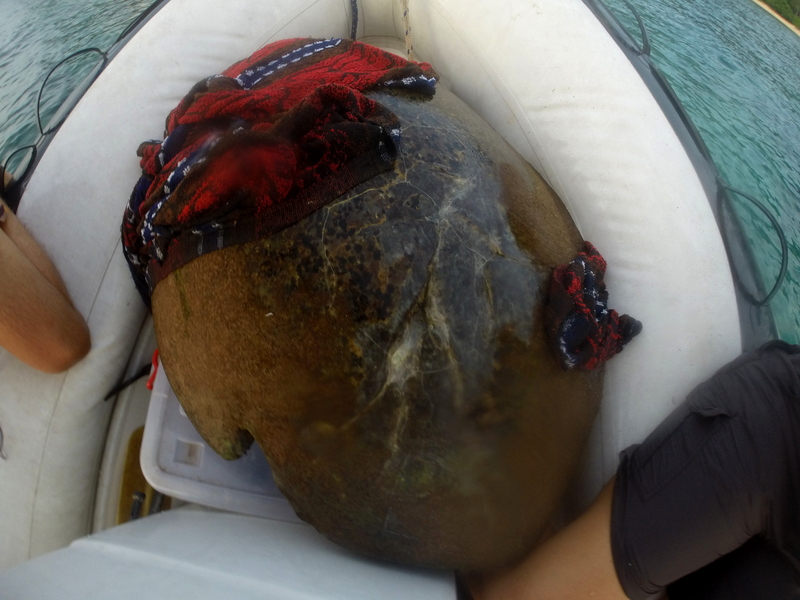 John got out of the boat to get a closer look, what he saw was a full grown female green turtle with extensive shell damaged from a boat propeller. She was very inactive and wasn’t able to move her hind flippers. She also had buoyancy issues which meant she couldn’t dive down to get food or avoid dangers. If she was left in the river she would of only lasted a few more days. It took 8 people to get the large mother on to our boat meanwhile JTP staff and volunteers back at the project started preparing for her arrival. Luckily we filled Jo’s tank a few days earlier so we would have somewhere safe for her to recover. 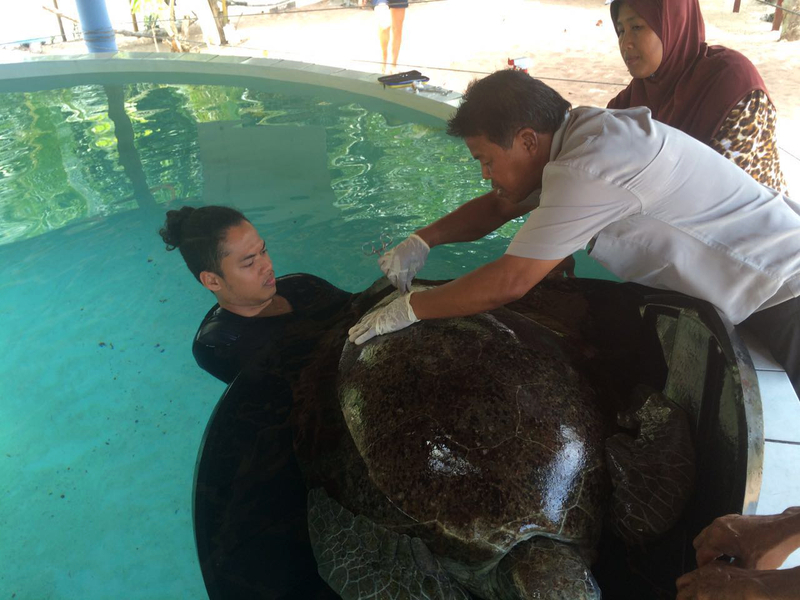 Marine biologist and JTP manager, Izzati, cleaned and medicated her wounds before we left her for the night to adjust to her new temporary surroundings. For the next few days we tried to get her to eat, we collected sea grass and fish but unfortunately she wasn’t interested. She was still unable to dive or move her hind flippers and spent most of the day floating around on the surface clearly traumatized by her injuries and from her encounter with the boat propeller. The local vet came to see her on the 11th of April and he injected her with antibiotics and cleaned her wounds. She still wasn’t eating which was a major concern for us, but we saw a little bit of movement in her flippers. 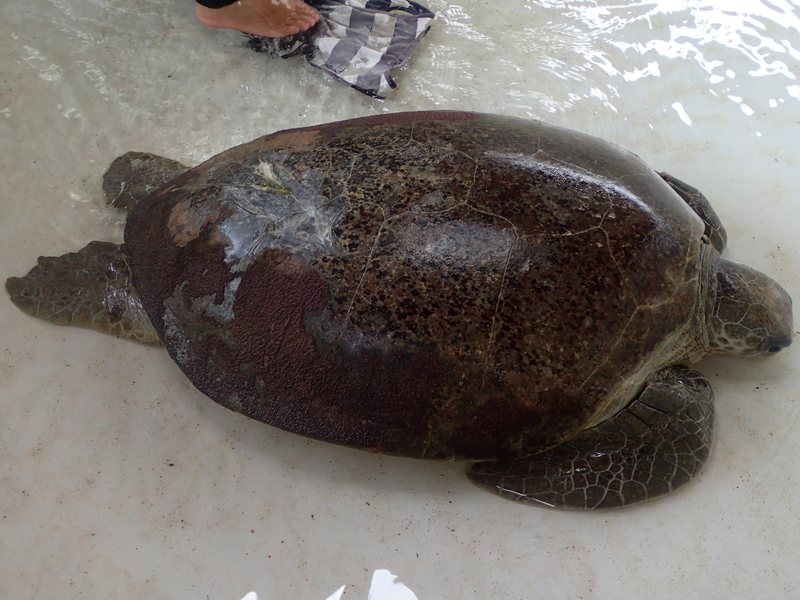 We contacted a couple of sea turtle biologists who gave us great advice about the best rehabilitation methods. We were told that he had seen many cases like this and in most instances when the shell heals over, the buoyancy issues normally right themselves. However, there was also a possibility that she could be suffering from infections or internal damage which could only be seen by an x ray. The next day, the 12th was a great day here at JTP……she finally started eating! And oh boy was she hungry. She managed to work her way through a large amount of sea grass. Things were looking up for this beautiful turtle. That night she even started moving her hind flippers and attempting to dive more frequently. Unfortunately her bum resurfaced with every attempt. She was getting stronger everyday and her appetite was very healthy. We kept cleaning and medicating her wounds. Her recovery seemed to be going well but sadly on the morning of the 23rd, she was found submerged on the bottom of the tank. 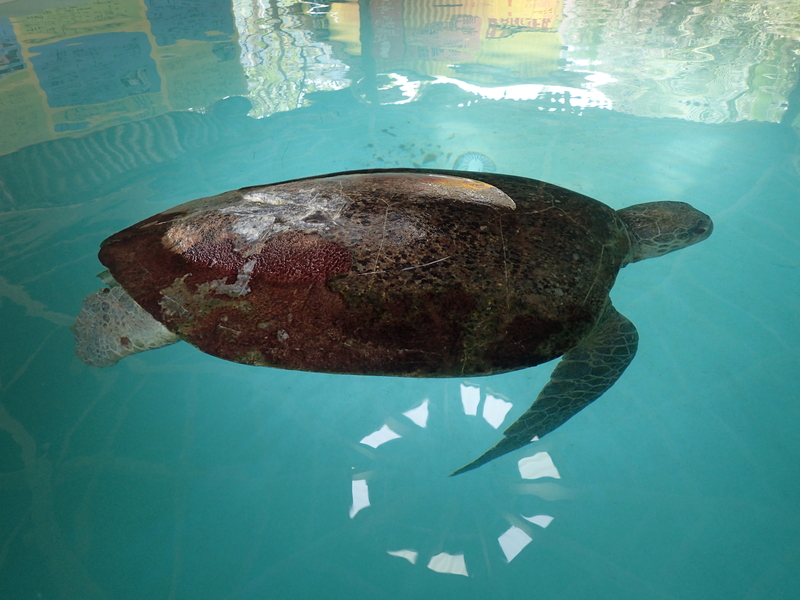 JTP staff carefully climbed into the tank to see if she was just sleeping but regrettably she had passed away. Our in house marine biologist preformed an autopsy on her and once inside we could see the extensive damage on her spine. Although we tried our best to help her, her death was unavoidable. 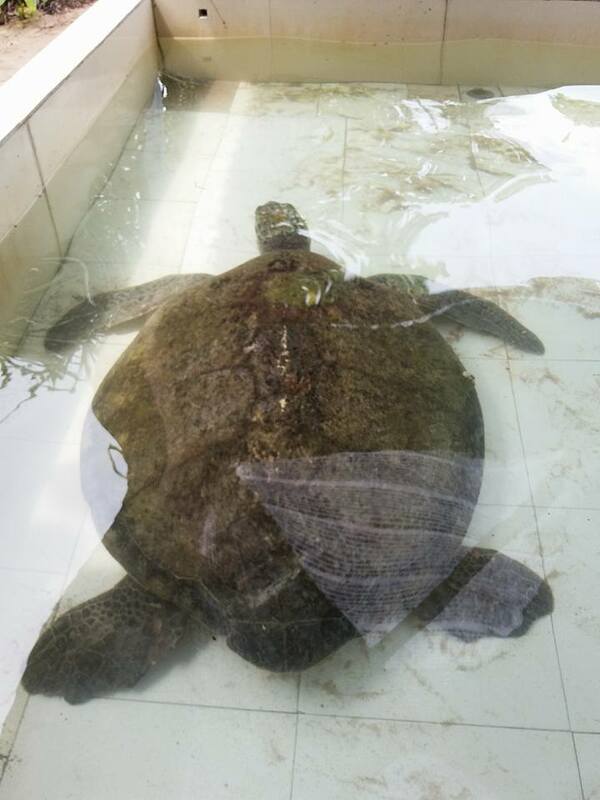 Although there was no happy ending to this story for our poor injured sea turtle, we here at Juara Turtle Project appreciate that we made this magnificent creatures last few weeks of life as comfortable and free from predators as we we could. She could at least sleep easy and eat some delicious sea grass. On the 16th of February late in the afternoon, large balls of crude oil could be seen rolling in on the waves. 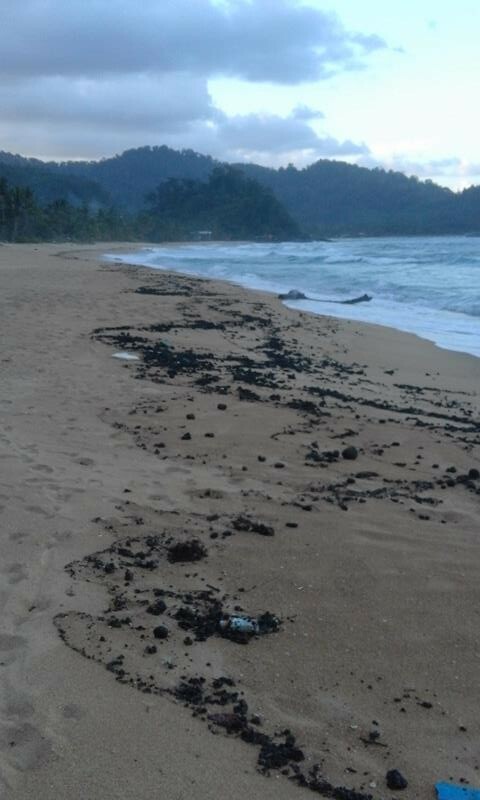 Solidified oil washed up on Mentawak beach through the night but the full extent of this environmental catastrophe was only visible the following morning. 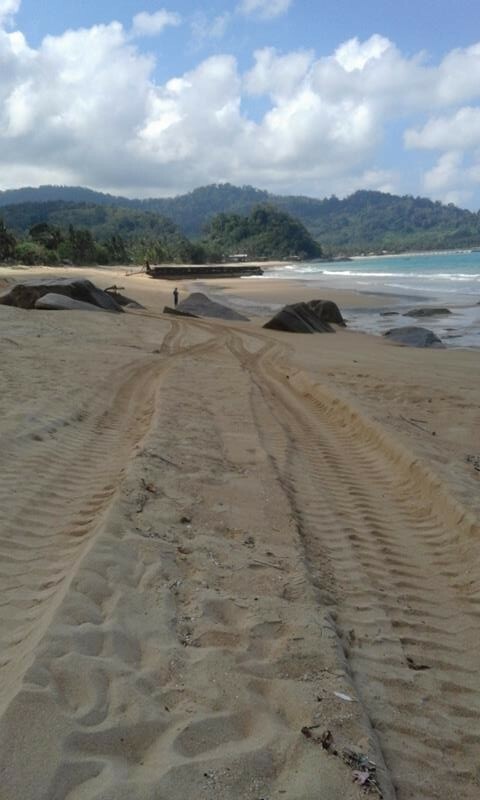 Mentawak beach in Juara Bay was hit hardest. 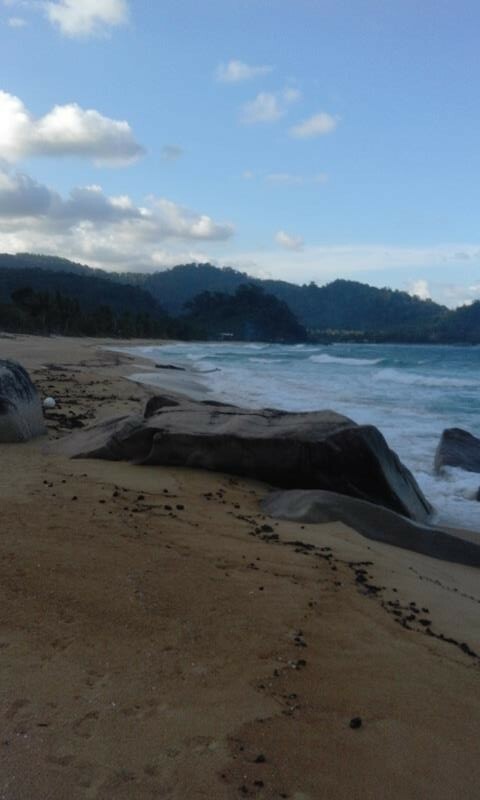 This beautiful beach is used by local families, tourists and is one of the last known refuges for our nesting Green and Hawksbill turtles on Tioman. Resort owners along the beach were out in full force. JTP and Little Planet assembled staff, volunteers and locals who were all eager to help keep our beaches safe and clean! 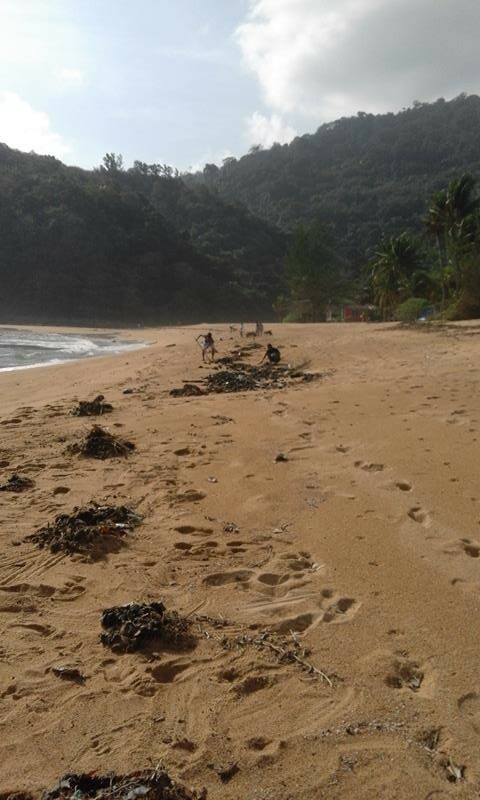 Alvin from Reef Check was contacted and he immediately alerted the Marine Park officials and Tekek Town Council. Help was on the way! 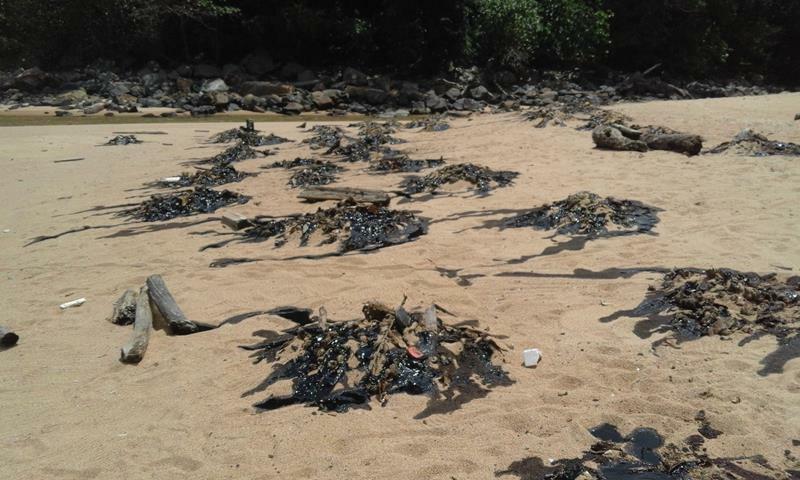 The clean up team spent a grueling day in 40 degree heat moving the oil by hand into big piles which we transferred to wheelbarrows and dragged through the thick sand to relocate near the road. Juara Lagoon Resort unfortunately received the bulk of oil. Little Planet staff played a major role in the days to come, toiling through the next week collecting and moving the oil. From this area alone 700 cement bags were filled each weighing around 50kg! We were left with a big question…..what do we do with the oil?! The solution came from Juara Headman, Razib. Thanks to Razib working closely with the authorities and for organising a JCB to move all 700 bags to a pontoon boat. 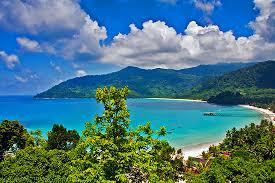 On the 11th March the oil was taken to the mainland to be disposed of by the Malaysian Government. 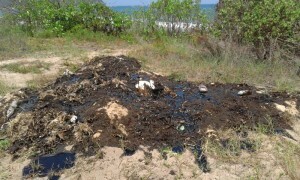 This is not the end of the story, this catastrophe highlights a need for deeper understanding of oil spill mechanics. Where did this crude oil come from? And how much still remains in the sea? There was no news of sunken liners or accidents so we can only assume it was irresponsible dumping. Industrial liners run on crude oil and sadly the leftover poor quality oil that resides in the bottom just gets dumped overboard causing havoc to local marine ecosystems. Will we ever know which liner was responsible? Or will justice ever be sought. Unfortunately it is unlikely. 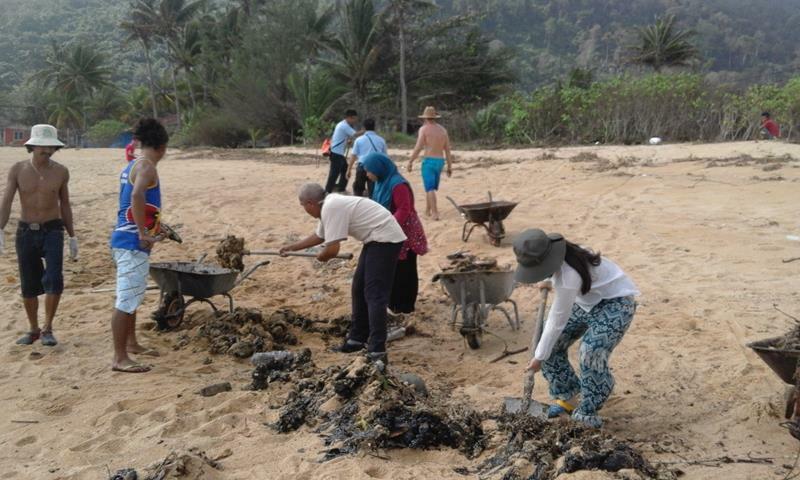 Our hope here at Juara Turtle Project – with the support and companionship of the local community, local authorities and resort owners – is to have an oil spill initiative where there is a response team set up with all the resources required to clean up and dispose of waste. Support is needed from relevant government officials. Oil needs to be removed in days, not weeks. We need to put an end to irresponsible oil dumping. This is the very least we can do for the beautiful planet we live on. We live in hope that one day we as a species can learn to respect our home without destroying it.